Image left to right: Dominika Mackiewicz (VINCI Construction UK), Samantha Dale (VINCI Construction UK), Khai Fletcher (VINCI Facilities). 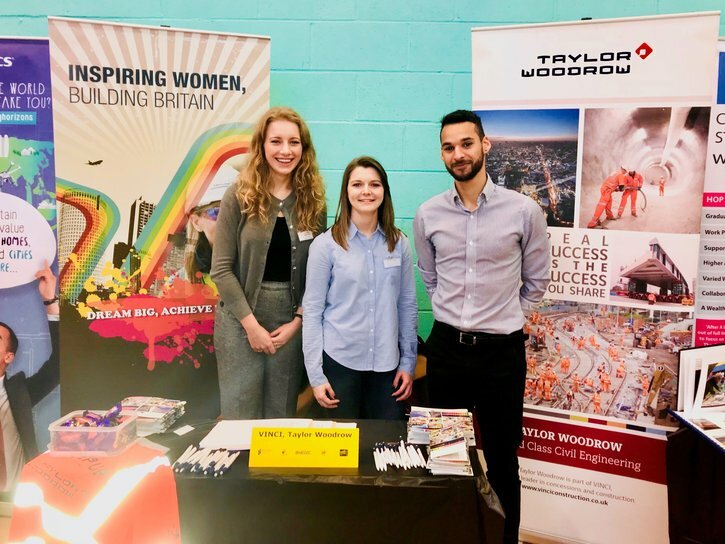 On Thursday the 25th of January, members of the VINCI Construction UK team attended the Brighton, Hove & Sussex Sixth Form College (BHASVIC) Futures Fair in Brighton. The fair was attended by both students and parents and offered a wide variety of stands for future options after leaving sixth form. We were at the fair to talk about both the industry as well as options for pursuing a career at VINCI. Interest in the company was quite high, especially in our apprenticeship programme and work experience. However, most conversations were about informing the students of the breadth of careers the engineering industry supports. The Futures Fair was an excellent opportunity to increase the visibility of the industry amongst 16 – 18 year olds. “I hope that might have inspired someone and helped them to find their perfect career” – Dominika Mackiewicz, VINCI Construction UK. “It was valuable to glean current students career expectations, interests and opinions of our industry. Answering questions regarding such helped both challenge and consolidate knowledge of our own disciplines, business units and wider industry alike. Furthermore, engaging with fresh minds provides a fascinating insight as to new movements in education and an opportunity to ensure we do not stand still and become complacent but remain competitive. Theoretical teachings in higher education should inform practical application in industry and vice versa.” – Khai Fletcher, VINCI Facilities.